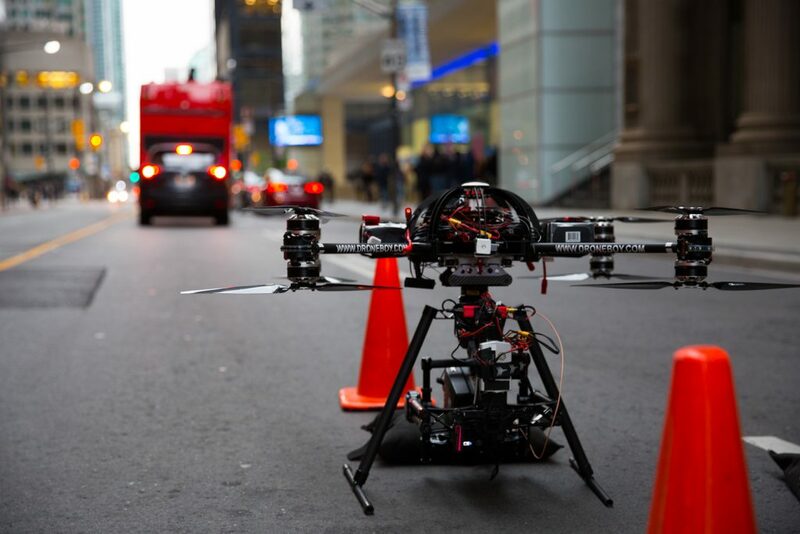 Almost daily we have film and TV producers call us asking “how long does it take for you guys to pull a permit to fly drones in downtown Toronto (Vancouver, Calgary, Montreal, Halifax…)?” The answer is simple – we already have this permission in place and could do it tomorrow, or even this afternoon just so long as production has their film permit and the required security assets in place and ready to go. DroneBoy has what is called a Standing Special Flight Operations Certificate (S.F.O.C.). This is our flight permit and the golden ticket that allows us to operate any time within each of the five flight regions in Canada. This means that we are good to go just as long as the project is within the rules set out in our S.F.O.C. 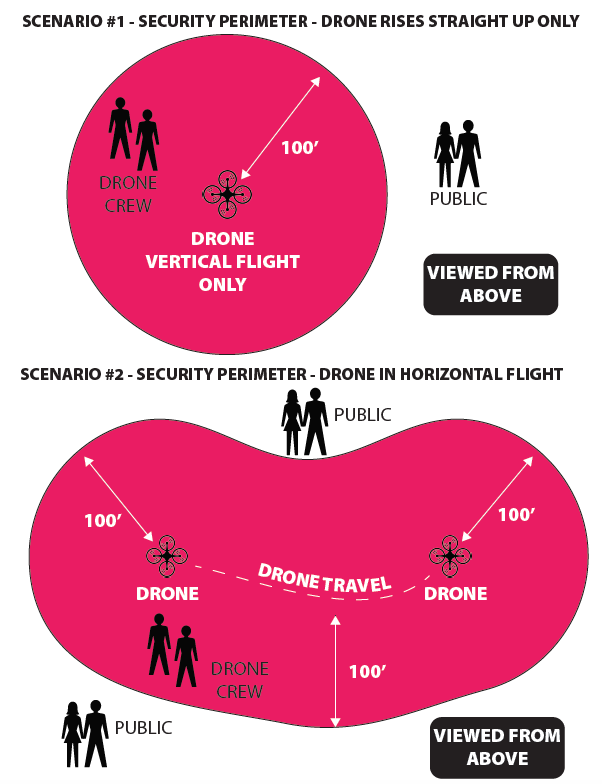 There are LOTS of stipulations on our flight permit but the big ones are that the drone must remain at least 100’ horizontal separation from the public, not go above 400’ and that there can be no flying over active roads or property we don’t have permission to overfly etc. The same rules that we implement on every other job we fly. During most urban operations, it is the site perimeter and security plan that can take the most effort. In any downtown core there are busy roadways and sidewalks and we need to maintain that 100’ horizontal separation from everyone who is not a part of the production. Sounds easy but it can be a daunting task. With the right production team and resources in place, street closure permits can be obtained, Pay Duty Police organized and a proper security plan can be implemented. This is the part that can take a little time and effort but it is worth it (and mandatory) as it guaranties compliance with the rules and creates a safe production environment for everyone. The security perimeter and perimeter assets (security personnel etc.) are the responsibility of Production but the DroneBoy team are here to help put this together with you so that we all get it right. 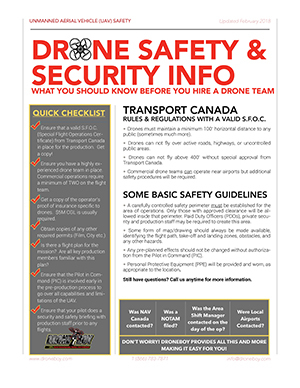 Safety and compliance on a drone shoot is everyone’s responsibility. For complex shoots downtown it is always best to have a tech scout day on the location well in advance of shoot day. In attendance should be all the with key production staff, the Locations Manager, Director and DP if possible. During this site survey we will learn exactly what your team are looking for in terms of shots, angles and location specifics. This will help us determine where we need to put our drone and what flight paths need to be flown in order to get that shot. During this time we also look for overhead obstructions, areas of unexpected wind turbulence and even places where the drone may behave badly due to magnetic or other forms of environmental interference. From this we can work out our proposed launch location(s) and exactly where the security perimeter(s) needs to be to and what other resources need to be in place in order to make the shoot a safe and legal reality. We will help you assemble all this information and assist your production staff by creating a detailed security and site plan that will be implemented on shoot day. Sometimes the Film Office may want to see this plan as part of your film permit application. On shoot day prior to any drone flights we will require a meeting with all of the members of your security team in order to do our Drone Security Brief. Here we brief the folks who will be maintaining our security perimeter during our flights and this usually consists of the Pay Duty Police, PA’s and even hired security staff from your team. A communications plan will be put in place and all security questions and concerns will be addressed. It is crucial that all security staff have radios or other appropriate communications equipment as well as visible accreditation (uniforms, reflective vests etc.). Simply placing a PA in street clothes at the end of a street with no radio and expecting them to stop all traffic and pedestrians simply does not work and is not actually legal. Only Pay Duty Police can legally stop the public. Next, our Pilot in Command (PIC) performs our Safety Brief where with all of the cast and crew who will be within our security perimeter during drone operations. Here we introduce our team, discuss the day’s operation, where and when our flights will take place, as well as drone safety and emergency procedures. This only takes a couple of minutes but it is a critical and contractual part of our operation. The only way that anyone can be inside our 100’ security perimeter is if they are a part of the production and have attended of our Safety Briefing for the day! On multi day shoots a safety briefing will be heald at the start of each day. After all this hard work and preparation, we take flight over the closed off, secure streets of downtown (your city name here) and we capture the most mind bending aerial perspectives anyone has ever seen. Directors and DPs marvel at the shots. Producers can’t believe the speed and efficiency of the operation and get excited about all the money they saved by not having to hire a helicopter. Your audience is blown away by that new, dynamic aerial perspective and your project is a HUGE success and goes on to win an Academy Award. And all of this done safely, effectively and within the confines of the regulations. Awesome!